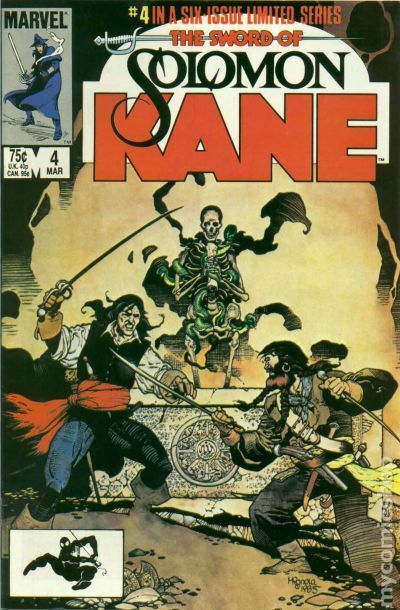 Robert E. Howard's SOLOMON KANE in comics - RKMBs v9.0: Rob's Damn Boards .:|:. There's two recent books from Dark Horse that collect the entire Solomon Kane run of stories previously published by Marvel. 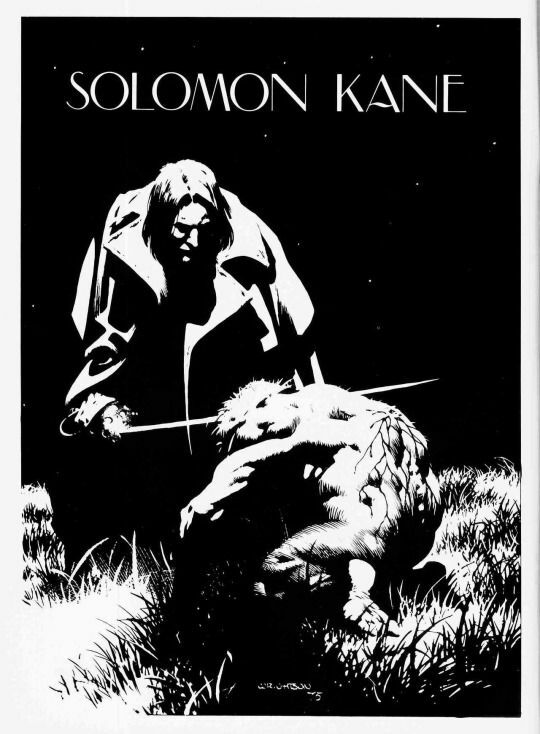 One is titled THE SAGA OF SOLOMON KANE, that collects all the stories that appeared in black-and-white Marvel magazines, spanning a 20-year period. About 60% are Robert E. Howard story adaptations, with a few new/original stories. Plus dozens of beautiful pin-up pages, including this one by Wrightson. A tremendous collection of artistic talents drawing the character: Gene Day, Ralph Reese, Al Weiss, Neal Adams, Pablo Marcos, Mike Zeck, Howard Chaykin, Sonny Trinidad, Rudy Nebres, David Wenzel, Dan Bulanadi, Steve Carr, Al Williamson, Colin MacNeil, Jim Fletcher, Bob Gould, John Buscema, John Byrne. And Wrightson. Ranging from pin-ups to full stories, but nicely interpreted, either way. 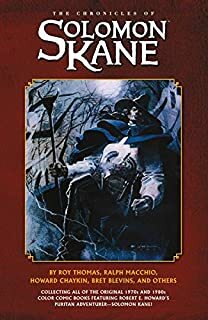 A second thinner volume, CHRONICLES OF SOLOMON KANE, collects all the color Solomon Kane stories done for Marvel, a 1976 two-issue Thomas/Chaykin story done in MARVEL PREMIERE 33 and 34 (adapting Howard's "Red Shadows"), and a six-issue 1985 miniseries, 4 of which are Howard adaptations. Between the two volumes, they adapt 13 of the 16 Howard stories, some of them adapted twice, by different hands. 4 of the 16 are incomplete story fragments by Howard, one loosely adapted and expanded on freely, the others not adapted. Two of the four Howard fragments were expanded and adapted in separate new books by Dark Horse, CASTLE OF THE DEVIL, and DEATH'S BLACK RIDERS about 10 years ago, that I found not overly satisfying reading. The first at least had very ornate art. I liked the Howard fragment stories better in a Robert E. Howard text paperback edited by Ramsey Campbell, where Campbell I thought did a far superior job of expanding them into full stories that were good reading. 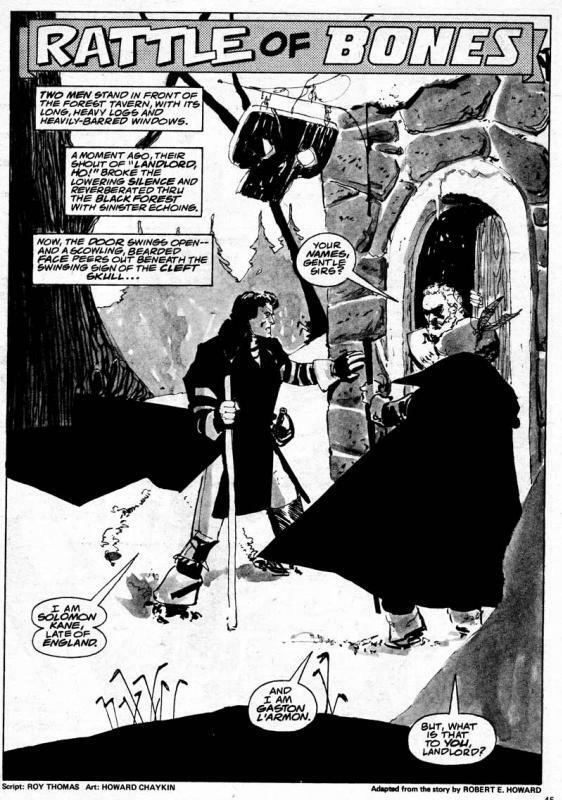 And while I thought it was relevant, listing another place where Wrightson's page could be found in a collected edition, I recall at the time regretting not creating a separate topic for Solomon Kane material, and in the back of my mind intending to at some point. Solomon Kane is I think my favorite of Robert E. Howard's characters, in some ways even over Conan. I always liked the historical aspect of Kane. That Solomon Kane travelled on ships at the beginning of British colonialism to the four corners of the earth (or at least had the potential to). I saw him as the most connected to the modern era and the least mythological of Howard's characters. And I also enjoyed that he is a devout Christian, but with a conflicting wanderlust for adventure and violence. And with a list of artists drawing him that's a who's-who of the industry's best talent (Neal Adams, Al Weiss, Barry Windsor-Smith, Gene Day, Howard Chaykin...) how could you possibly go wrong? It was mind-blowing for me when this stuff was released in collected form how sporadically these stories were published, across an assortment of magazines and comics over a roughly 20-year period, and despite that I already had about 95% of them, to see them collected together what an enormous amount of talent had contributed to this brief obscure run, how cohesive they were, and how true they were to the original Robert E. Howard stories. For me, only the two later Dark Horse adaptations (CASTLE OF THE DEVIL, and DEATH'S BLACK RIDERS) published around 2010 were somewhat disappointing. 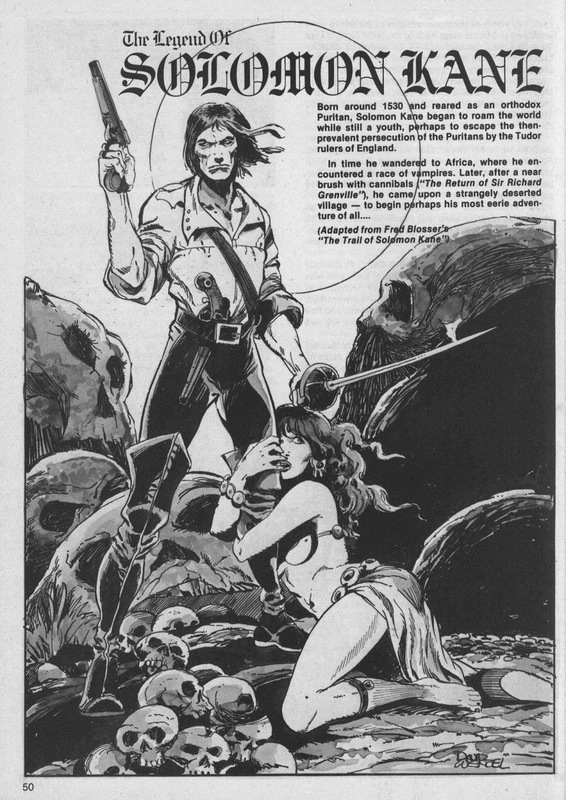 But still filled the void of some previously un-adapted Robert E. Howard Kane fragments, and still presented some nice art. 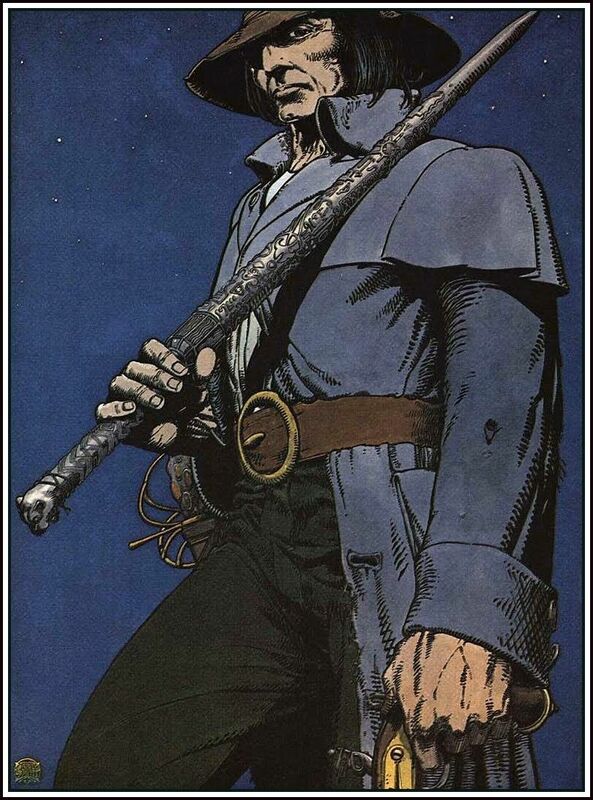 Much as I'd like to see new versions of Solomon Kane, I'm concerned in the modern era they'd just re-invent the character into something other than the character Howard created. The two collected editions of the Marvel material present an interesting package, offering both a consistent story, and remarkable variety in so short a series. As envisioned by Barry Windsor-Smith, from The Robert E. Howard portfolio (1975). the other 4 images in the 5-page portfolio are Bran Mak Morn, Thoth Amon, Valeria, and Conan. By Rudy Nebres, from an early 1980's pin-up in SAVAGE SWORD OF CONAN. This version colored, from A SHORT BIOGRAPHY OF ROBERT E. HOWARD, July 1999, published by Cross Plains. A sampling of the Robert E. Howard comics stories collected from Marvel, by Ralph Reese (adapting the first R.E. Howard Kane story), Steve Gan (adapting the 2nd), and Howard Chaykin from MARVEL PREMEIRE 34 (from the 2 part story by Chaykin in issues 33-34, adapting "Red Shadows" the 3rd Howard Solomon Kane story). Plus an all-new non-Howard story, drawn by a very new-to-comics Mike Zeck in 1976. Beyond this early story, Zeck first made a name for himself penciling MASTER OF KUNG FU from roughly 55-100, his first regular series. From the fourth consecutive Robert E. Howard story "Rattle the Bones", a beautiful and atmospheric sample page by Chaykin. Choosing which CFD broker to trade with is one of the most significant and critical decisions any trader has to take, The internet loaded with websites offering CFD trading, and despite choosing a broker is not a Catholic marriage it is always good to start off on the right foot. ?????? Yeah, the substandard knock-off has become much better known than the superior Robert E. Howard adaptations. Well, I actually liked the Van Helsing movie. 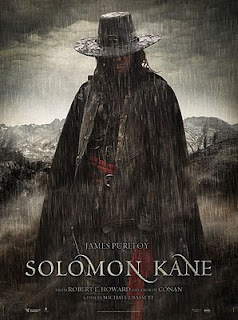 I've tried several times to watch the revisionist Solomon Kane movie out a few years ago, but it just wouldn't take. I thought Marvel's 6-issue 1985 series was the best adaptation. And even nicer in the collected trade. That single Wrightson pin-up page makes you wish he could have done an entire story. A full-page illustration used as an intro-page, that apparently pre-dates the SSOC comics stories it ran with.